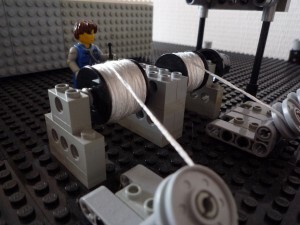 During the building of the Bailey tower crane I was inspired by the Lemniscate cranes working in the port of Vlissingen and Terneuzen for the discharging of mainly coal from ocean going bulk carriers. 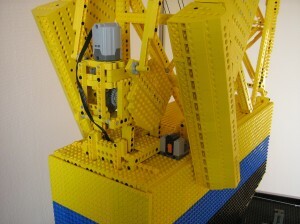 The graceful movement and perfect balancing of these cranes offered a real challenge for building a Lego model. When one of these floating cranes came in drydock on the shipyard I’m working on, I got the opportunity for a closer look, take pictures, and, even better, I was able to get a copy of the General Arrangement plan. 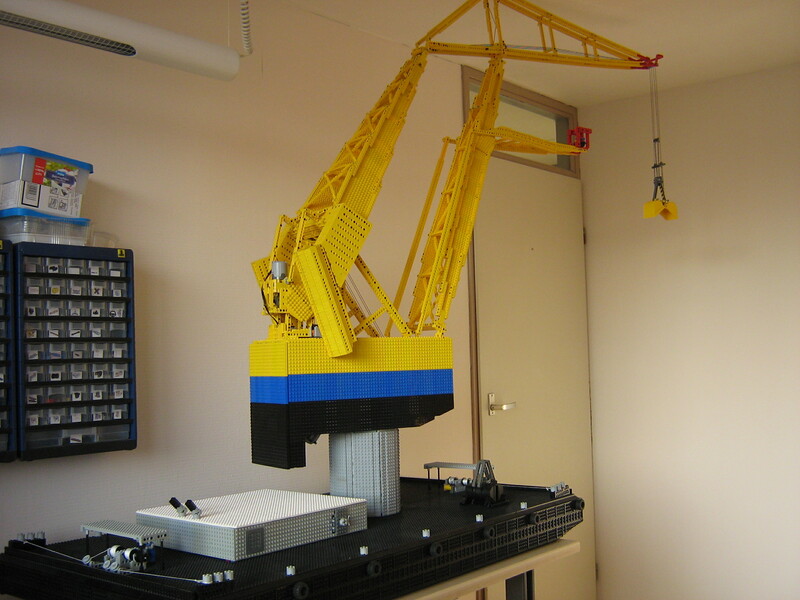 Initially, I decided to build the crane in the livery of our client Ovet, but after checking my Lego inventory, this proved to be too expensive. The Ovet colours are mainly gray, yellow and green and I would have to buy too much parts. Searching the internet I found out that in the port of Amsterdam, the same cranes are working, in a yellow, blue and black colour scheme. This proved to be more suitable, financially. 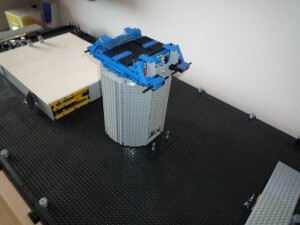 I decided to built to scale 1 : 30. The Bailey tower crane, I built before was 1 : 20, but I expected too much problems with the moving masses typical for this type of crane, when using this scale. Specially challenging for this built were the slewing bearing (always! ), the grab operation and balancing the jib movement. The slewing bearing is documented in the post “Slewing bearing 150 mm”, on this site. 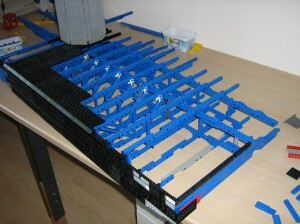 The jibs are balanced with counter weights. These counter weights must be positioned as low as possible for stability, as the crane is mounted on a floating pontoon. 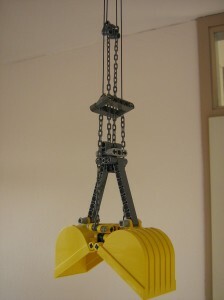 When the crane is at rest position (at minimum outreach) the counter weights are horizontal, with the weight as far forward as possible. To get balance in the model, while using lead pallets for weight, I had to deviate a bit from the dimensions of the original by extending the counter weights a bit longer forward. Credits to Werner Verhage of Ovet, who gave me tour through his crane no. 9 during his lunch break.